Welcome to our second annual year in review blog post! Here we’ll take a moment to review several major product developments that we rolled out in 2015 and give you a sneak peak of what’s brewing for 2016. Stock Rover Markets was our biggest bombshell this year, so let’s start with that. In September, we opened up a brand new site designed for daily market check-ins, quotes, and more. Below is a snapshot of the Markets main page. Whereas Stock Rover remains our heavy-hitting stock research platform, Markets is a super-fast and (if we do say so ourselves) attractive site for everyday information gathering about financial markets. But it’s more than that, too. You can explore an interactive earnings calendar or go deep on any single stock with fundamentals, charting, and analyst estimates. If you haven’t explored Markets yet, check it out! And here’s a tip: when you’re in Stock Rover, mouseover the Market Summary panel header for a link to Markets in a new tab. Coming soon for Markets: Based on the overwhelmingly positive responses we’ve received about Markets, we plan to make it our new website homepage. Don’t worry, the change will not affect the resources that are currently available on our website, it will just make it even easier to get straight to market news and data when you visit us. In April, we gave Stock Rover a facelift, adding in features like the user-friendly Quotes Box and Start Menu, and improving the way data is entered and accessed throughout the user interface (UI). We streamlined certain actions and also eliminated common points of confusion. It was a major step forward in our ever-evolving web app. See the before and after pictures and a full list of what we changed here. Coming soon for the Stock Rover UI: Wouldn’t it be cool if Stock Rover and Markets were integrated into one beautiful, seamless platform? We think so too. We’re working on it. 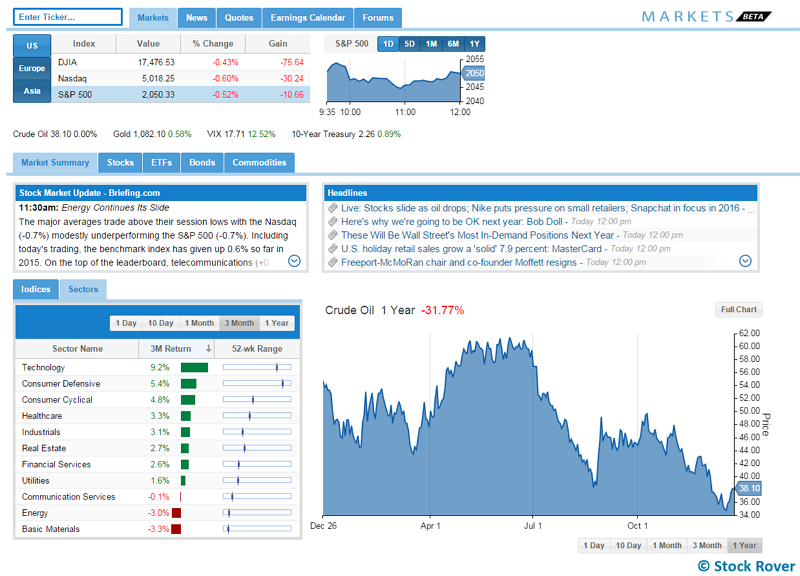 Also introduced in April, Portfolio Rebalancing is the latest major addition to our arsenal of Premium portfolio tools. You may find that over time your portfolio gets increasingly unbalanced as you make new trades and as some holdings outperform others. 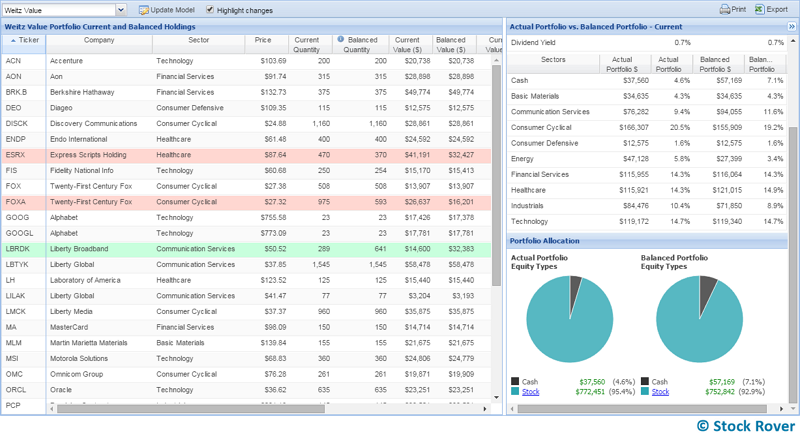 The Rebalancing window helps you make a plan to get your portfolio back into your desired balance. Just enter your desired balance for a stock or sector, and Stock Rover will calculate what trades you need to make to get there. Coming soon for portfolios: Very early next year we’ll be rolling out brokerage integration (discussed in more detail below), soon followed by the ability to track non-priced assets (like options and bonds). Further out, we’ll be developing a portfolio “health check” feature. In September, we added a data feed from Zacks that aggregates analyst recommendations. You can see how many analysts from major equity research firms give a stock a buy, hold, or sell rating, plus you can see how those ratings have changed over the past three months. The “consensus rating” averages the analyst ratings for a single numerical value (1 being a strong buy, 5 being a strong sell). 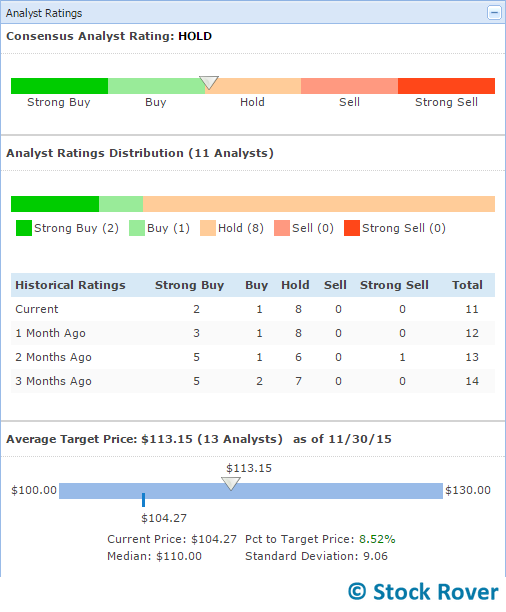 There is also the range of analyst target prices for the stock, with the average target price calculated. In Markets, find analyst ratings under Quotes > Overview > Analyst Ratings. In Stock Rover, find them in the Insight panel’s Detail tab, under Analyst Ratings. Premium users can also screen on this data or add it to any view in the Table using the ‘Add Column’ search box (or import the Analyst Ratings view from the Library). Coming soon for ratings: In our next release, Analyst Ratings will be moved to a more prominent position in Stock Rover’s Insight panel. We’re very proud of the content we put out this year, from the Dividend Fantasy Portfolio series to the March Midness Tournament, and of course many in-depth articles on stock picks. Creating original, unbiased, and educational content for our users is an important part of our company’s mission, which is why keep it all in-house. On top of our blogging, since November we have been putting out a weekly market and economy news briefing called the Weekly Market Brief. The brief gives you a quick shot of data about major events in the business world. It can be found in the first half of our weekly newsletters, as well as on our blog. Coming soon: No surprises here. We want to continue bringing you top-notch investing content! The very first thing you’ll see next year is the ability to connect your brokerage account directly to your Stock Rover account, so that your portfolio in Stock Rover gets automatically updated with any trades you make. We are absolutely thrilled to bring you this much-requested feature. Brokerage integration will eventually be a Premium-only benefit, however, during its beta phase in Q1 2016, all users will be able to try out brokerage integration completely free. Stay tuned for details in early January. We are currently working on our own proprietary formula to analyze and grade stocks. As this is still in the early stages, we cannot share any details, but our hope is to roll out this exciting new element in 2016. One of our goals next year, based on feedback from our users, is to create new membership plans that will provide more flexibility and options for our diverse userbase. As the plans are still being developed, we cannot yet offer any details. It’s impossible for us to reflect on our work without recognizing our incredible, highly engaged user community. You are, after all, the reason we do what we do. So thank you for using Stock Rover, telling your friends, sending us feedback, and for generally helping us move forward. We look forward to serving you in 2016!